The cooking in Bronte is traditionally poor, of clear peasant inspiration, made with ingredients simple and natural, but, because of this, results rich of ancient, genuine flavors and of dishes nowadays forgotten. It is the expression of an ancient and original culture, certainly peasant culture, often dictated by the calendar (Saint Joseph, Saint Nicolas, Holy Friday, Thursday grass, …) or the seasons, fruit of a poor economy, based on the cultivation of cereals, on sheep farming and few other tree cultivations. The essential ingredients of sweets and cooking come directly from the local territory: almonds, pistachio, pulses, asparagus, prickly pears, mushrooms, vegetables, olive oil, milk. The legumes (green or dried) represent the majority of first courses: broad beans, chickpeas, beans, peas and lentils are cooked and used in many ways (pasta with beans, lentils and chickpeas or with broccoli, porridge chickpeas' flour, …). Up to few years ago, on Saint Nicolas holiday, even wheat, boiled and dressed with olive oil, was a traditional dish in the kitchens of the farmers of Bronte. The peasant tradition has left also very many dishes based on wild vegetables as the minestra maritata (mixed vegetables picked in the fields and fried with garlic and chilly), fried cauricelli (wild, white mustard), or pasta with wild fennel. Other common dishes are grilled mushroom of ferra (many varieties of mushrooms grow in the woods of Bronte), baked onions and grilled peppers. The pennette al pistacchio (the fruit is crushed and fried with onion, diced ham, cream, milk, butter and other ingredients). During these last years the pistachio has become nearly a protagonist of brontese cooking, above all in the preparation of first course dishes (besides the pennette, is also used with filled ravioli, the home made pasta with flour and crushed pistachios ("tagghiarini" o tagliatelle) and the pesto). The frascaturi and the maccheroni (maccarruni) . “A Finucchina”. 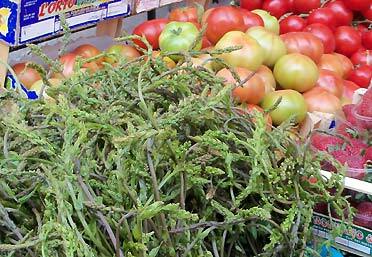 A vegetable cultivated in the Adrano’s gardens. 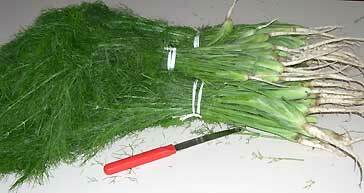 (It is in fact very young fennel) In Bronte’s kitchens it is transformed in a true delicacy. Can be cooked in various ways but becomes superlative with tiny pasta (“u curalluzzu ca finucchina"), nobody from Bronte can forget this simple and delicious peasant’s dish. The macaroni (maccarruni) sticks of about 20 cm. long, home made with pasta of hard wheat, rolled by hand over a board ("u scanaturi") with a reed and dressed wit wild sauce. The frascaturi, porridge prepared with chickpeas flour and mixed vegetables (usually "bastarduni", cauliflower). The "pasta ‘ncasciata", macaroni dressed con wild fennel, fried bread crumbs, sardines and tomato sauce. The pasta with macco (dried broad beans) and wild fennel. 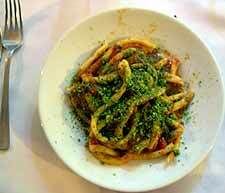 The spaghetti with sparacogni (a variety of wild asparagus) cooked with a little tomato sauce. 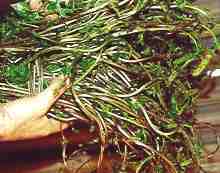 are a variety of wild herb looking somewhat similar to asparagus that grows spontaneously in the woods and stony ground. 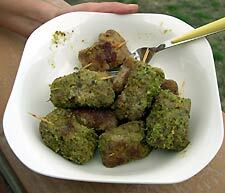 Represent, in the brontese gastronomy, a traditional, centuries-old, greatly appreciated delicacy. They grow, maybe unknown, in the woods of nearly all of Italy, but our ancient and original peasant culture, from which our local cuisine derives, was able to utilize the characteristic taste, slightly bitter, in dishes original and extremely tasty. 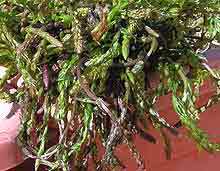 The sparacogni are used particularly in the preparation of sauces or fried with eggs and, also, as vegetables. The brontese folks absolutely adore this vegetable that grows spontaneous in spring in the sciare of the pistachio plantations ("the lochi") or in the woods of Etna and Nebrodi. Besides the search and "personal" picking of them, there is also almost a profes­sional figure ("u sparacugnaru") that makes a living picking this species of wild aspa­ragus even in territories remarkably far from Bronte. 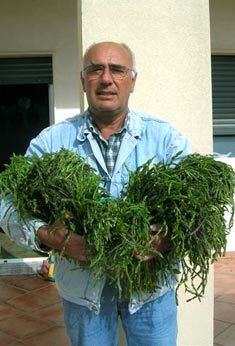 The herb is sold in small bunches by the "sparacugnari", in the street, and in greengrocer's shops at 3,00 to 5,00 euro each bunch. The unit of measurement "u mazzu" (the bunch) is equivalent, generally, to the quantity of sparacogni that can be held in one hand. The second dishes, that the poor brontese peasant could not afford or maybe did not even know, are very poor and unrefined. Besides those traditional and characteristic, all have a base of meat (the kid, the rabbit, the sausage with wild fennel, stewed or with tomato sauce, the lamb with pistachio) are also to be taken into consideration the castrated lamb chops grilled over embers and the sumptuous Caponata (made with eggplant, green olives, celery, zucchini, onion, tomato and capers). Finally, we do not want to forget the delicious, fragrant Bronte bread still cooked by some bakery in traditional stone ovens. The "Tamus communis" (vulgarly Tamaro, for the brontesi 'a spacogna). The sparacogni, for all Bronte, make up the main dish of their kitchen, so that many families always keep a good stock in the freezer for spe­cial occasions. Today they are also present as a specialty in the menus of all the restaurants and pizzerias in Bronte.